DPFs work by trapping bits of soot in the exhaust using a series of honeycomb filters. While this reduces emissions, blockages are common with this type of technology, especially if you only travel short distances in your car, and the system can’t reach a high enough temperature to cleanse itself. As the soot carbons build, this dramatically affects the performance of the car and the system requires a clean. This is where we assist here at Hi-Tech Performance, helping you to save a huge amount of money with our DPF cleaning services. Replacing a DPF could cost you anywhere between £1000 and £3500 depending on the make and model of your car. This figure can rise anywhere up to £7500 for a commercial vehicle, but you can have the filter cleaned at a fraction of this cost here at Hi-Tech Performance. We can professionally clean a blocked DPF and restore the performance back to 98% efficiency of a new filter. Our skilled and highly trained staff will diagnose the cause of the DPF failure and fix it for you, saving you a vast sum of money. If you don’t live near our specialist tuning garage in Northampton, ask your local garage to remove the blocked filter and send it to us for an in-depth clean. 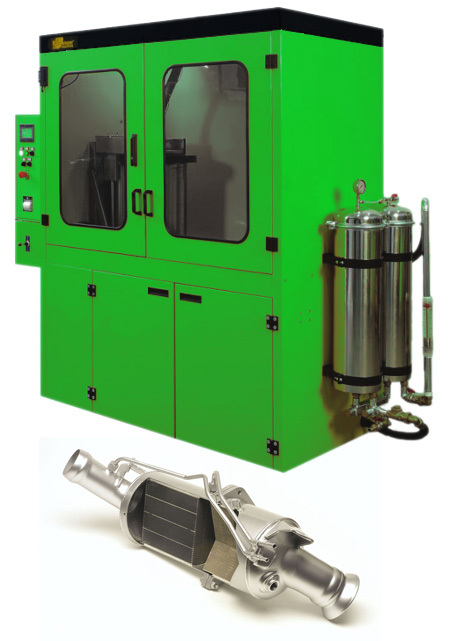 We will clean the diesel particulate filter and send it back to you the same day, just ensure you download, complete and enclose a copy of our DPF cleaning form. We guarantee you’ll save money with a DPF clean here at Hi-Tech Performance. For more details, please contact us today and call us to discuss engine tuning or a filter clean on 01604 755 220. Our DPF cleaning service, using state of the art technology, provides a fast and cost-effective solution. This regeneration process achieves 98% of the original new condition with certified results.